This article is about the air force rank. For the film, see Flight Lieutenant (film). 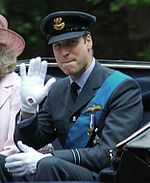 Flight Lieutenant (Flt Lt in the RAF and IAF; FLTLT in the RAAF and RNZAF—formerly sometimes F/L in all services) is a junior commissioned air force rank that originated in the Royal Naval Air Service and is still used in the Royal Air Force and many other countries, especially in the Commonwealth. It is also sometimes used as the English translation of an equivalent rank in non-English-speaking countries, especially those with an air force-specific rank structure. Flight lieutenant ranks above flying officer and below squadron leader. The name of the rank is the complete phrase; it is never shortened to "lieutenant". It has a NATO ranking code of OF-2, and is equivalent to a lieutenant in the Royal Navy and a captain in the British Army and the Royal Marines. The equivalent rank in the Women's Auxiliary Air Force (WAAF), Women's Royal Air Force (WRAF) (until 1968) and Princess Mary's Royal Air Force Nursing Service (PMRAFNS) (until 1980) was flight officer. On 1 April 1918, the newly created RAF adopted its officer rank titles from the British Army, with Royal Naval Air Service lieutenants (titled as flight lieutenants and flight commanders) and Royal Flying Corps captains becoming captains in the RAF. In response to the proposal that the RAF should use its own rank titles, it was suggested that the RAF might use the Royal Navy's officer ranks, with the word "air" inserted before the naval rank title. For example, the current rank of flight lieutenant would have been "air lieutenant". Although the Admiralty objected to this simple modification of their rank titles, it was agreed that the RAF might base many of its officer rank titles on navy officer ranks with differing pre-modifying terms. It was also suggested that RAF captains might be entitled flight-leaders. However, the rank title flight lieutenant was chosen as flights were typically commanded by RAF captains and the term flight lieutenant had been used in the Royal Naval Air Service. The rank of flight lieutenant has been used continuously since 1 August 1919. Although in the early years of the RAF a flight lieutenant commanded an aircraft flight, with the increasing combat power of aircraft and therefore squadrons, command and control has shifted up the rank structure (currently, for instance, most squadron commanders in the RAF are Wing Commanders, a reflection on the comparative combat power between the modern air force and its predecessor). The RAF's promotion system is automatic up until Flight Lieutenant. Every officer will attain the rank provided they complete their professional training and do not leave early. For Aircrew, Flight Lieutenant is reached 2.5 years after commissioning, BEng/MEng qualified engineers 2.5 and 1.5 years respectively, and for all ground branch officers, 3.5 years. Aircrew are appointed to an Early Departure Payment Commission upon reaching their Operational Conversion Unit, which is a commission for 20 years or age 40, whichever is later. Promotion to Squadron Leader thereafter is strictly upon merit; officers promoted beyond Flight Lieutenant are appointed to a Career Commission, or service to age 60. Resigning a commission is generally dependent on the needs of the Service, although an officer who has completed their Return of Service (service the RAF requires to justify its expense in originally training the officer) could leave after as little as four years. For aircrew, given the large expense required for training, this Return of Service is generally the length of their initial commission anyway, unless they re-role to a different branch having failed an element of flying training. Most aircrew reach their squadrons as Flight Lieutenants due to the length of training time required (up to four years for fast jet pilots). The majority of squadron line pilots are flight lieutenants, with some squadron executives or Career Commission aircrew reaching Squadron Leader. Aside from aircrew, whose work typically does not require active leadership for units of airmen, ground branch officers can expect to operate units that can range in size from a few specialist non-commissioned personnel to 50 or more personnel for engineering or other manpower intensive roles. The role of a Flight Lieutenant generally involves management of a team of specialists Non-Commissioned Officers and airmen, within their specific branch. In the RAF Regiment, a Flight Lieutenant generally has the same role and responsibility as a Captain in the British Army, in charge of a Regiment Flight of 30 men, and could be second-in-command of a Squadron of up to 120 men. Flight Lieutenant is the most common rank in the RAF; in April 2013, for example, there were 8,230 RAF officers, of whom 3,890 (47.3%) were Flight Lieutenants. In RAF informal usage, a flight lieutenant is sometimes referred to as a "flight lieuy". A Flight Lieutenant's starting salary is £39,236.40 as of 2015. In the Air Training Corps, a flight lieutenant is usually the officer commanding of a squadron. Retired flight lieutenants are the first rank that may continue to use their rank after they have left active service. The Royal Canadian Air Force used the rank until 1968, when the three armed services were unified and army-type ranks were adopted; flight lieutenants became captains. In official French Canadian usage, a flight lieutenant's rank title was capitaine d'aviation. Until the late 1970s, the Royal Malaysian Air Force used the rank. Thereafter the rank of captain was used instead. In the Danish Army, a flight lieutenant is called a captain (Army equivalent). The rank of flight lieutenant is an old Army rank for army pilots and is now used for lieutenants (OF-1). Matiur Rahman, Pakistan Air Force (later Bangladesh Air Force) pilot, who is honoured in Bangladesh for his attempt to defect to the Bangladeshi side at the start of the Bangladesh Liberation War. Gerald Bouey, former governor of the Bank of Canada. Prince Alexander of Yugoslavia, member of Yugoslavian royal family. ^ "Ranks and Badges of the RAF". Royal Air Force. 2015. Retrieved 22 March 2015. ^ "UK Armed Forces Annual Personnel Report" (PDF). Ministry of Defence. 1 April 2013. Retrieved 22 March 2015. ^ "Rates of Pay" (PDF). raf.mod.uk. Retrieved 1 April 2016. ^ "Armed Forces, Forms Of Address". Debrett's. 2015. Archived from the original on 13 September 2012. Retrieved 22 March 2015. This page is based on the Wikipedia article Flight lieutenant; it is used under the Creative Commons Attribution-ShareAlike 3.0 Unported License (CC-BY-SA). You may redistribute it, verbatim or modified, providing that you comply with the terms of the CC-BY-SA.